I've been down the coast a million times so I won't bore you with more pictures -- in any case the portion of the coast north of Shitiping isn't all that nice. The really great thing was that it was overcast all morning, so we didn't burn out toiling under a hot sun on the flat part of the coast. After lunch the clouds rolled away revealing lovely blue skies, and us with plenty of energy to cope with the hills of Hualien 64 under a hot afternoon sun. 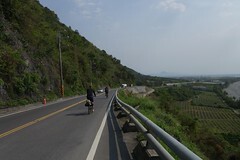 The entrance to Hualien 64 is just before the big red bridge at Dagangkou in the right center of the picture. The sign there points the way to Rueisuei but doesn't tell you how far it is. Hualien 64 (Ruigang Industry Rd) follows the gorge through which the rafting rides from Rueisuei come down. Hence, when you turn onto that road, the first thing you see is the rafting terminal. Running along the gorge the road rises several times, ending in a set of switchbacks that takes you up 200 meters or so for the final climb before Rueisuei. It is surpassingly beautiful and, with ~24 kms of hilly riding, a pretty good workout. Highly recommended. 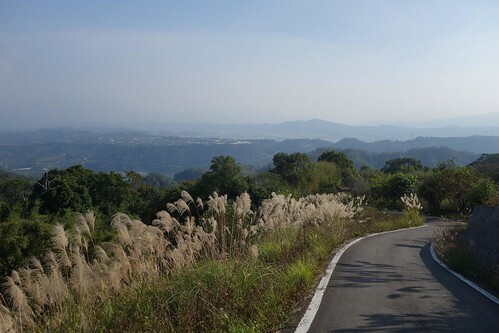 The road is shaded and narrow, excellent for a quiet bike ride through the hills. The only downer is the vans servicing the rafting expeditions, recklessly speeding along the road with no regard for others. There was plenty of wildlife, birds, bugs, monkeys, and of course -- snakes. The road clambered all over the gorge. A woman harvests grass from the roadside. Around every curve were lovely mountain views. Jeff and Kenji scream down a hill. Quietly awesome, Kenji did the whole ride on a 9-speed city bike. The afternoon sky was amazing. 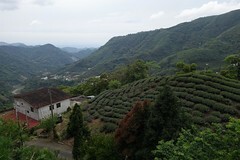 The peaks directly behind Chimei town. Chimei, the community halfway between the coast and Rueisuei, was a good place to grab a cold drink. All sorts of people were out in bright aboriginal clothing for the local harvest festival. Jeff has a lively exchange with the local kids at the drink shop. 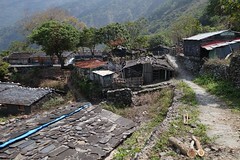 A landslide scarp looms over homes near Chimei. Outside Chimei, the gorge was still gorgeous. Checking out the view from a bridge. Rafters head downriver, screaming their lungs out. Looking back over the switchbacks on the final hill. At the summit the views are stunning. This view looks east from the top. Rain looms over Rueisuei to the west. Heading across the bridge into Rueisuei as rain threatens the Rift. Luckily, the weather in town was great. We stayed at our favorite place, the little hotel that charges us $500 for a single room, right next to the internet cafe. It's the Gaobao Lushe, blue sign, left side of the street in this photo. The couple that runs it is really sweet. And they are cyclists. Enjoying a well-deserved beer. After beer we had dinner at a nearby stir-fry place. The chef, a true genius, was reinterpreting local staples by the simple expedient of removing one element of them. For example, the tsung bao beef? No tsung! 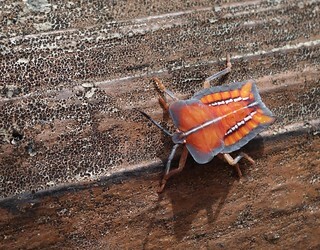 The pineapple shrimp? No pineapple! Our favorite was the gong bao chicken, prepared by frying the chicken, placing on the plate, tossing on a few chili peppers, and pouring half a bag of peanuts over the lot. Night. Rueisuei is a popular tourist destination in the summer, and the little train station sees a constant influx of vacationers. Sunday morning we raced up 193, one of the island's most enjoyable biking experiences. Rolling, a good workout, and bucolic, it's a favorite of local cyclists. Highly recommended. I can't recall ever being on this road on such a lovely day. After a 10 km rolling climb to the prison, it's downhill for a long stretch. One of the most pleasurable aspects of the ride: in many places a mother partridge and her brood were feeding by the side of the road. Here they bolt out of my way. 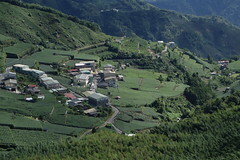 Just outside Hualien. Another glorious ride. Hope to see you on the next one! Ha! It was probably me you heard screaming. I was "captain" of a boat of Hash House Harriers going down the river after lunch on Saturday Aug 18, and there were some "cultural differences" about how to steer the boat! Very funny to think of you up there listening to me Michael! Did you take the time to visit the bat cave at Shitiping? They used to make a nice coffee made with water from the cave. Beautiful pictures and a great ride.